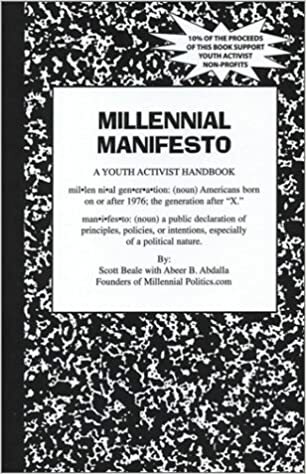 Di seguito riporto The Manifesto tratto dalla parte finale del libro di Scott Beale con Abeer B. Abdalla Millennial Manifesto. We are America’s future. We are a generation ready to take on the world. We believe our parents have failed to take into account the future or our values in today’s politics. We believe in individual responsability; and as individuals we must be able to work with others for a common good. We believe that community service is an important form of youth activism, but that politics, business, and faith are still necessary to improve our country. We believe that every being is affected when the environment is polluted. We demand greater responsability from corporations, communities, the government, and individuals for addressing environmental problems. Environmental protection should neither be a hobby of the wealthy nor a burden of the poor; it is a global problem that we all must address. Respect for human rights for all people is essential to the strength of any society, including a global one. We are a generation tha sees the positive potential of internationalism – the exchange of people cultures, and economic ties that bind countries. We also see the potential pitfalls of globalization if supranational companies, governments and organizations are not held accountable for maintening environmental protection, upholding labor standards, or addressing local needs. Our generation has strong faith and religion is important to us. This spiritual base is at the root of much of our activism. We believe the war on drugs, the war war on crime, and current gun policies need to be re-examined and modified with new voice. During our lifetimes, crime has dropped and yet the prison industrial complex has grown. We demand urgent action address growing inequality. The psychological, physical, and political implications of economic inequality are not given their due attention. Our most important political priority is education. As the sum total of all school age children in America, we see how some schools are failing and the cost of heigher education is rising. Education must be locally administered but federally supported. We believe that racism and discrimination still exist in our country and must be ended before they tear apart the unity of our nation. Our generation will end racism. Voting is important to us. Many in our generation are fighting to lower voting age. In fact, there is a new civil rights movement in our generation for youth rights. We do not believe that is acceptable to discriminate against people for any reason, including age. We also value human life. A majority of us think both the death penalty and abortion should be legal and more rare. We believe in liberty. The government has an important, but limited, role to play in society. We are concerned about terrorism and the expanding wars overseas. The defense of our country is paramount to us, but so too are the values that make our country great. We are not a monolithic block, but we all agree that there are many things wrong with this world and we all have a responsability to stand un and fight for a better tomorrow. *Quotes from this document come from the 2001 Century Institute’s Sagner Fellows as well as official youth statements of dozens of non-partisan conferences.